Ash eruption with stone throws occurred in 1873 in Crater XXIV, in 1876 in Crater XXVI, and in 1881 in XXVII Crater. 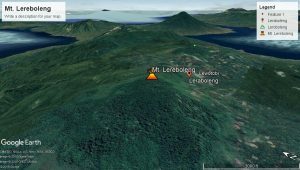 The shortest interval of resting activity of Mount Lereboleng recorded in history is 3-5 years, ie from the first eruption to the third eruption, while the longest is not known, because until now no eruption has occurred. In the Lereboleng Mountain complex there are 29 craters (former eruption holes) arranged in six cracks / eruption slits, three of which form a radial pattern towards the peak and the other crosses from north to south. Most of the craters are small with diameters between 12 to 100 meters. Gelimun crater which is 270 meters in diameter is the largest crater. The morphology of Mount Lereboleng and its surroundings can be divided into three morphological units, namely the Morphology of the Young Cone Morphology Unit, the Lereboleng Tua Morphology Unit, and the Old Volcanic Hills Morphology Unit. The geological structure that developed in Mount Lereboleng is in the form of faults and straightness while the crater structure is less developed. The structure of the fault that is developing is the normal fault that traverses the Northeast – Southeast and Southwest – Northeast. The fault found around the peak is the youngest fault and is a local structure and forms depression. This type of fault is a normal fault that is relatively North-South in direction. Besides the fault structure, there is also a straightness of volcanic (crater) trending Southwest – Northeast.